Although CD28 and CTLA-4 are homologous proteins, they have different expression and trafficking patterns within the cell. CD28 is constitutively expressed by T cells and localizes to the cell surface. In contrast, CTLA-4 is upregulated only after T-cell stimulation  and primarily localizes to an intracellular compartment due to a tyrosine-based internalization motif (Yxx^) within its intracellular tail . This motif results in the binding of the medium chain of the clathrin-coated pit adaptor complex, AP2, to the intracellular tail of CTLA-4, leading to its endocytosis from the cell surface [14-17]. CTLA-4 may also bind to the adaptor protein AP1, suggesting that intracellular trafficking of CTLA-4 emanating from the Golgi apparatus may also be a highly regulated process . Intracellular sequestration has two important consequences for the ability of CTLA-4 to inhibit the T-cell response. First, sequestration provides a mechanism for decreasing the amount of CTLA-4 that can interact with ligand at the cell surface and thereby deliver an inhibitory signal. Second, it provides access to lysosomal compartments which allows for greater regulation of CTLA-4 expression by increasing the protein turnover rate. CTLA-4 expression is controlled by multiple factors. In addition to transcriptional and translational regulation [19,20], several studies have demonstrated that protein levels are limited through posttranslational mechanisms. While CTLA-4 is found in several different intracellular compartments, a significant portion localizes to lysosomes [18,21,22], presumably accounting for its rapid turnover rate in activated T cells [22,23]. A short protein half-life ensures that CTLA-4 gene activity is tightly linked to expression levels within the cell. 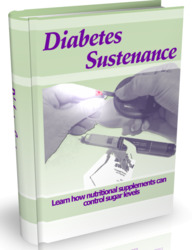 Thus, when gene expression is reduced or terminated, protein levels will rapidly reflect this change. A protein with a slower rate of turnover, such as CD28, could persist in the cell even after gene expression had been terminated . Thus, the rapid rate of CTLA-4 degradation provides a high level of control over when and where CTLA-4 is capable of inhibiting the T cell response. Because inhibitory signals generated by CTLA-4 are mediated through interactions with B7 molecules on the APC surface, a pathway must exist to specifically localize CTLA-4 to the T-cell plasma membrane. Intracellular CTLA-4 is known to rapidly polarize to a site facing anti-genic stimulation upon T-cell encounters with APCs . This pattern of trafficking may serve at least two purposes. 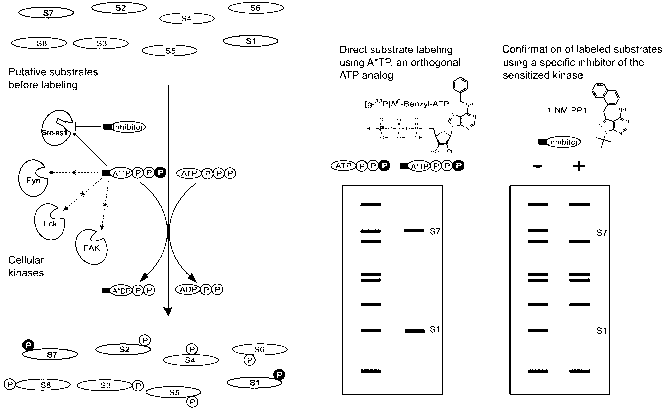 First, it may ensure that CTLA-4 interacts only with B7 molecules expressed by APCs that are also displaying antigenic peptide. This would limit the origin of CTLA-4-mediated inhibitory signals to the specific APC with which the T cell is engaged. Second, it provides a regulatory point for controlling CTLA-4 expression levels on the T-cell surface. Factors controlling both exocytosis of CTLA-4 from intracellular vesicles and its subsequent stabilization at the cell surface play an important role in regulating CTLA-4-mediated inhibitory signals (Fig. 1). During T-cell activation, CTLA-4 surface expression is regulated by at least two events that occur downstream of TCR signaling. First, an increase in intracellular calcium levels can enhance the rate of fusion between CTLA-4-containing vesicles and the plasma membrane, thereby leading to increased surface expression . Second, tyrosine phosphorylation of the intracellular localization motif within the cytoplasmic tail of CTLA-4 prevents interactions with the AP2 complex, suggesting that TCR-mediated kinase activity can stabilize CTLA-4 on the cell surface [14,16]. These trafficking properties may explain the observation that CTLA-4 expression on the cell surface at the T-cell-APC interface is regulated by the strength of the TCR signal. TCR signals of higher quality (affinity of TCR for antigenic peptide-MHC) are more efficient at translocating CTLA-4 from intracellular sources to the T-cell plasma membrane . This may represent a negative feedback mechanism in which a T cell receiving a strong stimulatory signal will specifically recruit CTLA-4 to the cell surface, where it can function to inhibit the response. Figure 1 Protein trafficking of the T cell inhibitory protein CTLA-4 during antigen specific T cell-APC interactions. T cell antigen receptor signaling induces the rapid polarization of CTLA-4 toward the site of T cell-APC contact. This is likely caused by a reorientation of the microtubule cytoskeleton and its associated intracellular membrane compartments. Polarization of CTLA-4-containing vesicles enables CTLA-4 to be specifically targeted to the immuno-logical synapse. Importantly, accumulation of CTLA-4 on the T cell surface at the site of contact with the APC is regulated by the strength of the TCR signal, with stronger signals being more efficient at localizing CTLA-4 to the cell surface. This trafficking property is not observed with CD28, a homologue of CTLA-4 which generates stimulatory signals. 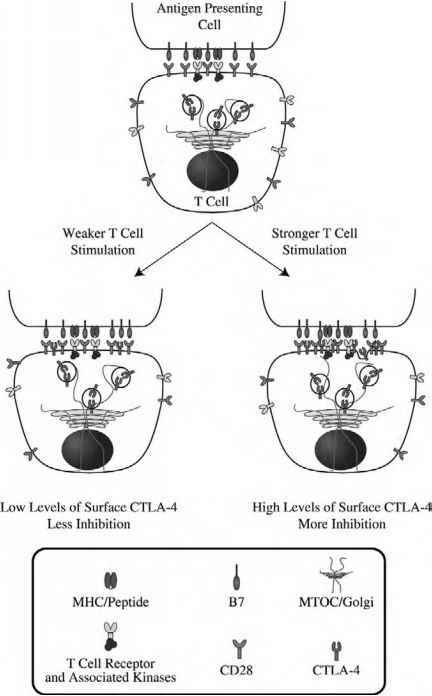 Because of these unique protein trafficking patterns, CTLA-4 may exert a greater inhibitory effect on T cells that receive stronger levels of stimulation and could thus function as a negative feedback control mechanism for TCR signaling. weak stimulation, the cell can still respond, as these conditions will not efficiently recruit the inhibitory molecule to a functionally relevant site, yet a mechanism still exists to attenuate or terminate strong stimulatory signals so as not to overload the cellular response.